Another Fall, Another SAFF Goneby! It’s hard to believe it’s November and another SAFF has gone by! It’s like a roller coaster ride.. the slow tick to the top and a whirlwind fun ride that’s over before you know it!! And what a ride it was! Full of yarn and sheep and bright leaves on the mountain, with a little chocolate, tacos and beer on the side! This year, like last, Debra Lambert and her amazing crew of Florida ladies came with the amazing goodies Deb creates in her shop in Sarasota. 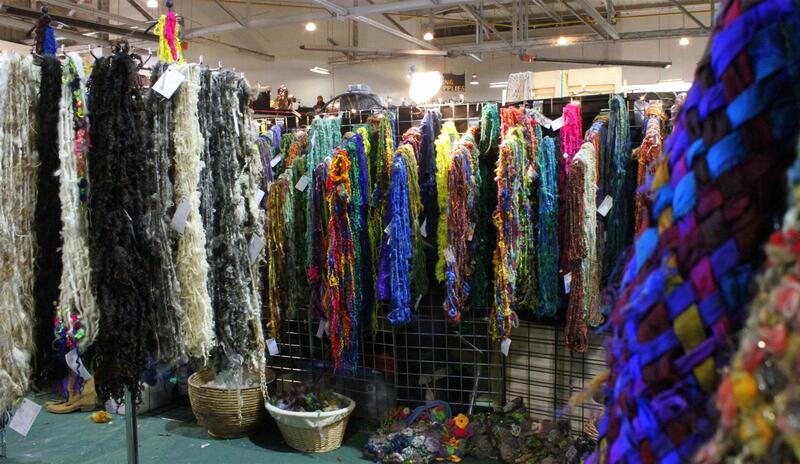 This year she was featuring breathtaking leather shawls and scarves trimmed in her handspun. These are one of a kind pieces that flew out of the booth! The one showstopper red leather shawl sold the first morning we were open!! She also had her signature leather bags, this year with woven panels. It’s a joy to have her energy and design in the booth each year! New to join us this year, was Danish Knitwear superstar Vithard Villumsen. Fresh of his successful tour of the US this Summer- which included joining us in the booth for Stitches Midwest, and a great set of Danish workshops in the early Fall, we were excited to have him back with us for SAFF. 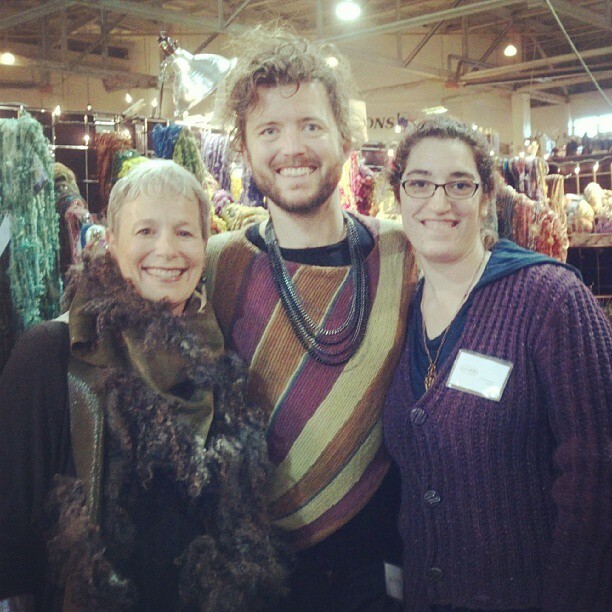 He taught a weekend full of classes, while his pattern samples were pet and enjoyed by all who came in the booth! 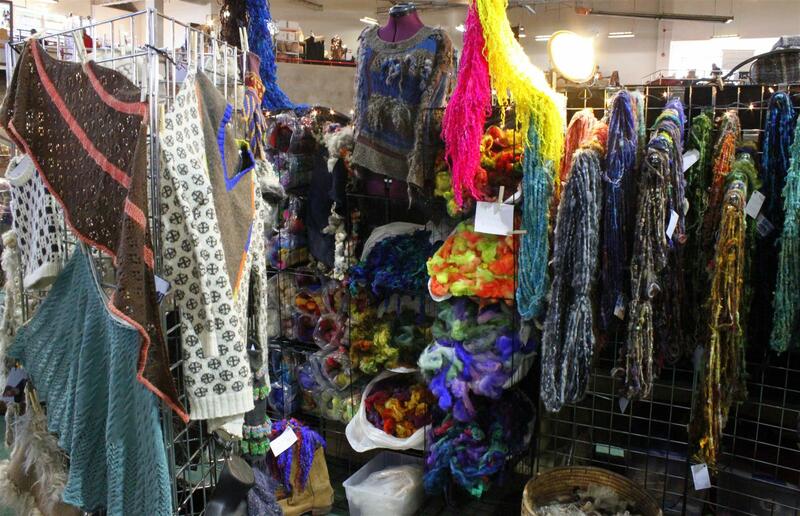 The booth was a cornocopia of color and texture! I was overflowing with fiber! Textured batts, new textured rolags, dyed fleece and locks and of course ethereal cloud mohair batts!! And the yarn! I spun so much yarn! I am always amazed at what sells most each year! Last year it was fiber! This year yarn… and the natural colored tailspuns were the most loved! 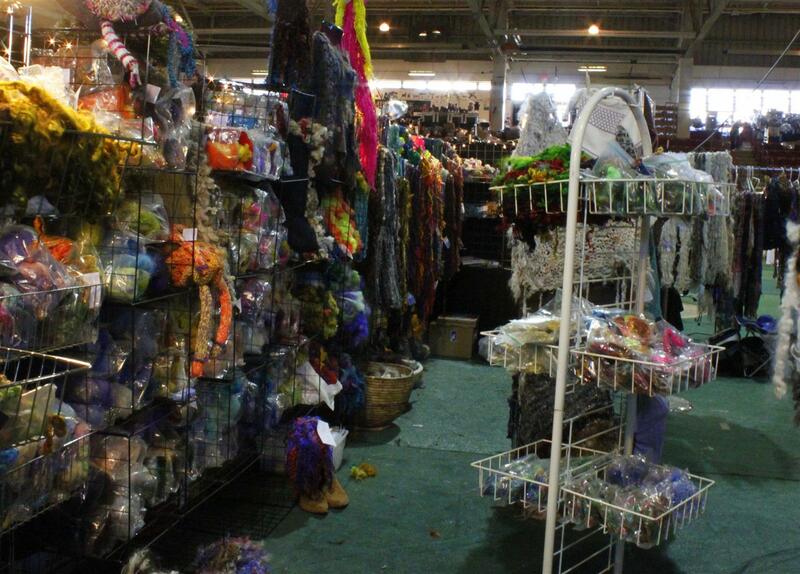 And people also seemed to love the bag your own loose fiber, rather than the locks and fleece pre-bagged! Good to know as this is how we will have it in the future! It’s also so pretty all the flowing colors you can just dig into! I had a great time prepping the fiber for SAFF. I’ve come into some of the most amazing cormo fleeces (I have 3 more coming for the next batch of dyeing and carding) It’s like butter and it was hard for me to not spin all the things myself! I’m happy that some of my favorites came home from the festival, and I admit they may not make the big shop update this weekend! *wink wink* I have to allow myself some fun, right? I’m so lucky that I taught 4 amazing classes!! We prepped fibers and corespun and wildplied and tailspun! I love to see the “Ah HA!” moments as students pick up something new! And in the corespinning class we came up with a NEW technique! That’s what I love about teaching.. we all work and learn together and most often the amazing happens!! And there’s the secret reason I teach.. to learn!! It was the perfect Asheville weekend- chilly weather that made you want to pet wool and inspirational shades of Autumn! And as we were in Asheville.. that meant we ate great food and got to see our friends we see far less often than we’d like!! Truffles from the Chocolate Fetish are always a must. Meals from Tupelo Honey Cafe and White Duck Taco were, as always, superb. I love White Duck Taco, and I was excited to bring my husband and Vithard for their first visits! With Fish Taco’s, Duck Mole Taco’s, Jerk Chicken Taco’s and Lump Crab Taco’s, among many others on the menu.. there’s something to make everyone’s mouth happy!!! Saturday night was much laughter and good beer and great food (Vithard’s first tater tots) with Conni Togel and Scott of Sheep Incognito and Stephanie from Lundabud. Then of course our annual Sunday Post Load out dinner with our good friends Otto and Joanne Strauch, of Strauch Fiber Company, Stephanie Stratton of Lundabud Knits, and Roo Klein from Moonwood Farms. OH we eat SO well in Asheville!!! I stayed up late one night spinning in the hotel lobby with my friend Melissa Ricks from WildHare Fiber and Stephanie from Lundabud.. that was super fun too!! And hugs and visits during the show from my friend Dawn of Mada Vemi Alpacas. I wish I had more time to hang with my friends like “normal people” but we always have to bookend everything with work. But it’s nice to have our few minutes, I treasure them. And then before we knew it.. the time had come to head back down the mountain! It was another amazing year, with new friends, old friends and lots of laughs!! I must thank all the customers who came out to shop and say hi!! I must thank and HUG and thank Deb and all the ladies from Florida (Betsey, Angela, Mary, Kathy and Kim) for all their help in the booth, as well as Vithard for all his help in the booth and the days leading up to the festival (I even put him to work at the carder!!) and of course.. the most thanks to my ever patient husband. Who mans the booth cash register, drives the car up the mountain, runs back and forth to target while setting up and generally deals with my crazy on a day to day (which admittedly gets a little crazier closer to the festival) I wouldn’t be able to do any of this without you!! Also thanks to the fiber sponsors that sent some fiber for this year’s SAFF classes!! Spinning Mermaid, Little Patch Alpacas and Cloudlover Fiber and Yarn! Your fiber was much loved and appreciated!! SO NOW— There’s a lot of new and awesome stuff coming, (like these awesome new textured rolag sets pictured to the left!!) so check back here over the next week!! I’ll be updating the shop with the POST SAFF fun this weekend!! See you there!